Review: This is a coming of age story about a daughter of a Scottish farmer and the family struggling to survive once a tragedy strikes in the 1900’s. A fantastic but yet unusual film. Adapted from a novel by Lewis Grassic Gibbon. This is a very Scottish film and you do have to concentrate a bit on the accent. 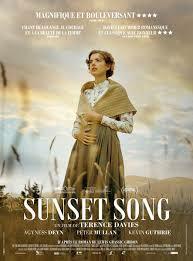 Apparently it has taken Terence Davies 18 years to bring Sunset Song onto the screen.The cinematography is amazing in this. It is worth just watching the film for that alone, for example the camera catching the long swaying grass in the fields. The running time on this film is 2 hours and 15 minutes so very long. It was great to see some actors who haven’t done much work yet and are just starting out (except Peter Mullan). The music was used well in this. There were so many moving scenes. I have not read the book but do feel that the film left out a lot things that weren’t developed or explained properly. The themes that occur in this story is having the ability to have to change in different circumstances, morality, man and the land, the role of women and also the community. I almost felt that it had a touch of Terrence Malik to this film especially his directorial work on Days of Heaven (1978) as both was mostly set on a farm. What I have come to realize watching this film is how many people must have been in the same situation as the daughter. It must have happened more than we realize.